1. Pay into a pension – You reduce the amount of tax you pay and still get to save for your retirement – win-win. If you are paid through PAYE into an occupational scheme then pension contributions are deducted first and so you pay tax on the lower, remaining amount of your salary. For people who pay into a personal pension the company tops it up automatically for basic rate payers. Higher rate tax payers will need to claim back the extra on their self assessment form. 2. Claim your expenses – If you have legitimate expenses that you can claim then do. It might be a hassle going through and logging your receipts but you could save a lot of money. 3. Check your tax code – From next month the new standard tax code will be 1185L. This means the first £11,850 you earn in a year will be tax free. If your tax code is different it could be because of company benefits such as a car, private health care or a gym membership. 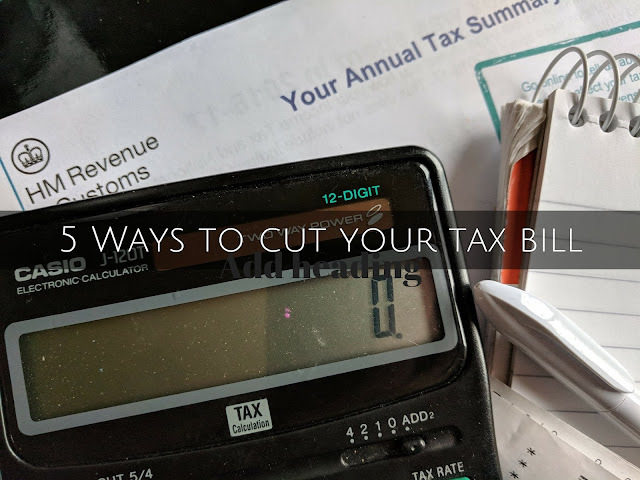 If you no longer receive company benefits you need to get your tax code corrected as you could still be being taxed on them. 4. Marriage allowance – If your legal spouse or civil partner doesn't use all of their personal tax allowance but you do then you can apply to have their unused allowance transferred to you. This can also be backdated for previous years and if applicable you will get a cheque for the tax refund. 5. Dispute the amount – If you need and to complete a self-assessment form make sure you calculate yourself how much you owe. If the amount differs from HMRC's calculations then go back and check your figures. If they still don't agree put your case to HMRC. If you want to join in with this week's Finance Fridays then add your link to the linky below. Any post concerning financial matters is allowed. Full details here. It doesn't have to be published today as you have until 23.55 on Tuesday 13th March 2018 to join in.